← Video: At DART, we pause and give a special thanks to all veterans. Fair Park Beyond the Fair is a once-in-an-occasion series looking at the venues in the neighborhoods surrounding Fair Park and MLK, Jr stations. Every year, millions travel to Fair Park for the State Fair of Texas, but did you know there are many more reasons to keep coming back? This week is North Texas Beer Week and in recognition we’re highlighting one of the best craft beer bars in all of North Texas — and it happens to call the Fair Park area home. Craft & Growler opened three years ago this month. The idea came from craft beer fan and patent lawyer Kevin Afghani and wife Catherine Kinslow. The business model is based on a simple product that was not offered in many North Texas bars previously: growlers. A growler is a glass, steel, ceramic or even plastic container used to transport draft beer. Bring your empty growler to Craft & Growler (or buy one from the venue) and get it filled up. Pop a top on it and take it home to enjoy. Craft & Growler isn’t just a beer filling station. Come in and have a seat at one of the many tables to enjoy a flight of beers (four five-ounce samples of different beers) to help you choose which to take home. 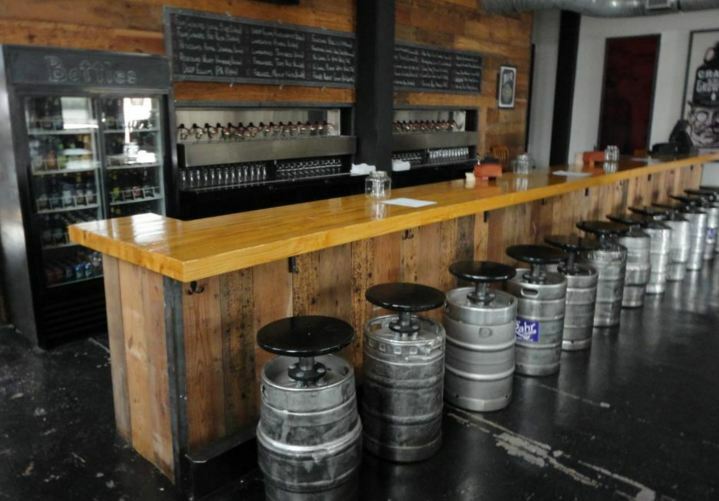 Careful observers at Craft & Growler will notice something very peculiar: the beer taps. These taps are not like your traditional pull-handle taps most bars use. They are called Blichmann Beer Guns. These guns inject CO2 into the growlers before the beer, displacing any air and keeping the beer fresher longer. Take the DART Rail Green Line to Fair Park Station and walk across Parry Avenue to check out Craft & Growler for yourself. This entry was posted in Destination DART and tagged fair park beyond the fair. Bookmark the permalink.